Information On Solar & Electric Swimming Pool Heaters. Pool Solar Heaters Info. & Savings Chart. 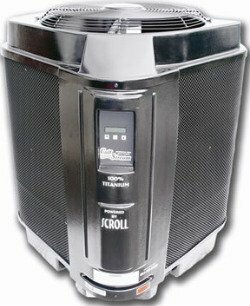 Swimming pool heaters will allow you to s-t-r-e-t-c-h your swimming season out just a little further. It could also be viewed as an investment and may increase the value of your pool should you choose to ever sell your home. Many parts of the country don’t have the right combination of water and air temperatures to make swimming comfortable early or later in the season. If you’re thinking of a couple more months of swimming, you may want to consider a good pool heater. An electric pool heat pump uses and the war air outside. The strange thing is heat pump don't actually generate heat. Pool water is drawn from the pool pump motor, goes through the filter and passes through the heat pump water heater. The heat pump has its own heat with a fan that pulls in outside air and circulates the air through an outer evaporator coil. The liquid refrigerant inside the coil absorbs the heat from the air and turns into a warm gas. The warm gas goes to the compressor which increases the heat, then make its way through a condenser. It's the warm condensed gas that heats your pool. Basically, the heat pump takes the heat from the air and uses it to heat the water in your pool. You'll pay a little more upfront for heat pumps and electric swimming pool heaters, but you'll also experience savings over gas heaters as the swimming season progresses. Prices can vary, but you can expect to pay between $2000 - $3000 and up to $5000 for larger pools. Geographical areas should also be taken into consideration. Here in Florida we have a very long swimming season compared to, let's say, Minnesota. People up north will need to run their heat pump earlier and longer if they want to swim more. You can go to this source to see the actual cost of heat pumps. The sun is there. Why not use its power and warmth to heat your pool? That's a good question and more pool owners than ever are turning to this renewable source of endless energy. The sun works 24/7 so let's use it. Solar pool heaters work by using your pool pump motor (or a dedicated pump) to pass part of your pool water through a series of solar collectors than warm the water, then returns the warm water back to the pool. Solar pool heater are both eco-friendly and affordable. And they're certainly one of the best options for hotter area like here in Florida. Even places that may only have a few months of swimming can benefit from solar pool heaters. 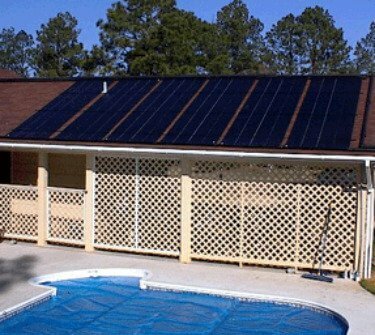 How Much Does a Solar Pool Heater Cost? On average, a solar pool heating system will cost between $2,500 - $4,500 to buy and professionally install but this can pay you back due to the energy savings you can experience. And with an average lifespan of 15–20 years, they’re more durable than gas or heat pumps. When sizing a solar pool heater we need to consider a few things such as pool size, the desired temperature gain, and sun exposure minus factors such as shade and tree obstruction. Not all houses are good candidates for solar heaters. You need to have a good amount of unobstructed roof space for at least 4 - 6 hours per day. Expert solar panel installers suggest you should have half of the pool surface area dedicated in solar panels. To find the surface area for your pool, simply multiply length x width of your pool. For example, if you have an 18' x 32' pool, you'd have 576 sq. ft. For round pools, the equation is pi x radius squared. For a 24' round pool, the calculation is 3.14 x 144 = 452 sq. ft. Pools that experience less sunny days, or windy conditions, might consider installing an extra panel or two to compensate for the loss of sun. Lots of direct sunlight is needed for the panels to heat up enough. They only work in direct sun. Gas pool heaters are very simple to understand and use. You can get them to run on either natural gas or propane. A portion of your pool water passes through a type of combustion chamber that warms the water before returning to the pool. Gas pool heaters are the most efficient form of pool heating and ideal for quickly heating your pool. Unlike heat pumps and solar heaters, gas heaters are able to better maintain a desired temperature regardless of the weather. What’s The Average Price Of Gas Swimming Pool Heaters? 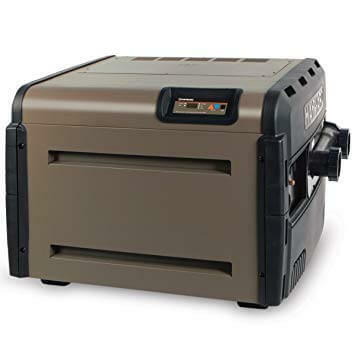 Inground gas pool heaters can cost between $1200 - $3800, but this is really dependent upon some factors such as your pool size, how long you plan on using, type of heater and brand name. For the monthly cost of gas, you can expect to spend $300 - $400 per month. But again, this is also dependent upon many variables such as higher temperatures will require more gas, climate, usage, splash out and topping off with cooler water. What's The Right Size For A Gas Heater? You'll first need to know the surface area of your pool as described above. A good gas heater can add 1 - 2 degrees of heat per hour to the average pool. For best results, it's better to have a slightly larger heater for your pool. This will not only heat your pool faster, it can save a little on gas due to it not needing to work as long to heat the water. But, if you want to maintain a constant temperature by using a thermostat, then a smaller size pool heater can be used. 100 - 200 BTU heater to heat 1,000 - 10,000 gallons of pool water, or up to 300 sq. ft.
200 - 300 BTU heater to heat 10,000 - 20,000 gallons of water, or up to 500 sq. ft.
300 - 400 BTU heater to heat 20,000 - 40,000 gallons of water, or up to 800 sq. ft.
400 BTU heater to heat 40,000 - 80,000 gallons of water, or up to 1200 sq. ft. Repairs to gas heaters are usually not recommended for DIYers. Calling in a professional tech can cost hundreds for severe problems. Tinkering with swimming pool heaters is not something you want to do. What's the price? Is that the best you can do? There are others out there I like. Out the door installation cost? Does it have an automatic control? Automatic shut-off? Is it rust and corrosion resistant? Show me why. Will it install easily into my existing pipes and/or plumbing? How large are the panels and how much room will they take up? Is it a compact design that would should fit my pool? No condensation or corrosion, right? Does it have a good thermostat? Is the thermostat automated? Is there maintenance? If so, what and why? Will you take care of that or do I? What's the warranty? I need to see specifics. What if I install it? Will that void the warranty? I want that in writing. Do you have a contractor? Is he licensed and insured? Is he experienced in these kinds of heaters? I need to see proof. So you install it or do you have someone else? Contract it out? Who do you use? Why do you use them? Are they experienced? If it does fail, who will fix it? Will you, or do you contract that out to someone else? Who is it? Why do you use them? Ask these questions to anyone trying to sell you a swimming pool heater. Be sure to get specifics and everything in writing. Whatever anyone tells you they can also put it in writing. If it's not in writing it didn't happen.